For many of us, Dr. Perkins is a living legend. And in light of recent events in Baltimore, his message is needed now more than ever. My children grew up reading about Dr. Perkins in the book, Hero Tales (Vol 2), where a brief summary of his life and accomplishments were featured alongside other heroes of the faith like Dietrich Bonhoeffer, Jim Elliot and Corrie ten Boom. How surreal it was to then have him sitting with us at breakfast during his visit to Ozark Christian College last spring! 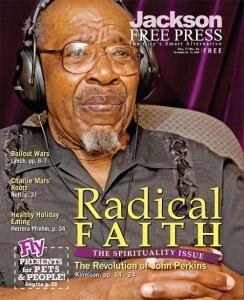 Now 85 years old, Dr. Perkins continues to be in demand as a leading evangelical voice for reconciliation. Most recently, he made headlines for his comments regarding the Prosperity Gospel. For those who may not be familiar with Dr. Perkins, check out this article by Jessica Kinnison for the Jackson Free Press. First published in December, 2008, it gives some biographical insight into this extraordinary man of faith and action. Finally, I hope you and your friends will join us for the Dream of Destiny Breakfast on Thursday, June 25th, at 7:30a in Cincinnati, OH, where Dr. Perkins will be speaking on “The Testimony of a Multi-Ethnic Church.” He’ll also be presenting two workshops during the convention week. Register for the DoD Breakfast HERE and share this post with your sphere of influence.